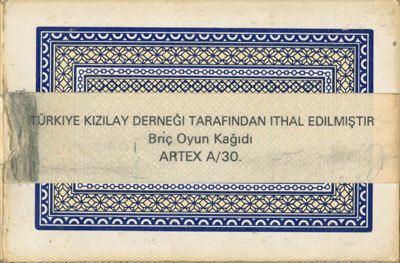 Artex A/30 brand for Turkey, 1980s, made by Játékkártyagyár és Nyomda, Budapest. 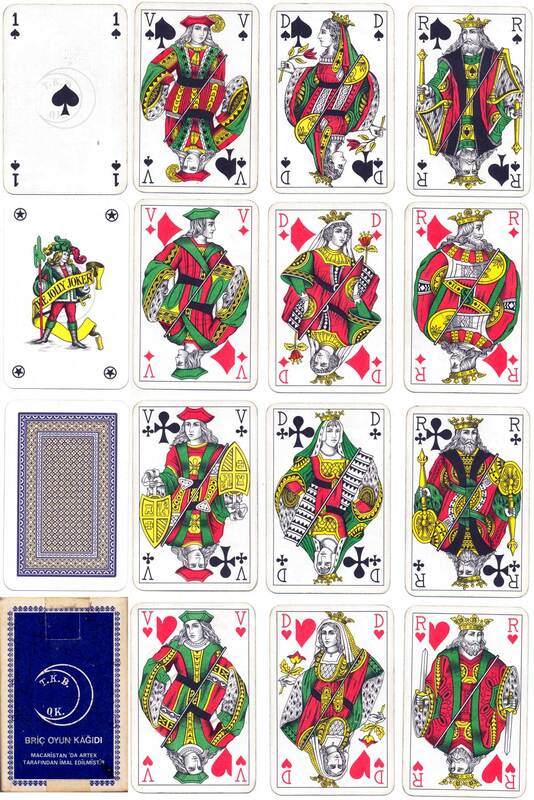 These Belgian/Genoese type playing cards are based on the French Paris pattern produced by Grimaud in late 19th century, but with green replacing the usual blue. The pattern was used in casinos in Belgium, Spain & South America, and had also been extended into the Ottoman Empire, the Balkans and the Mediterranean from Algeria to Syria. It is also known in Turkey. It is gradually being replaced today by the Anglo-American pattern. Above: the imprint inside a half moon on each card and the box reads T.K.B. - O.K. which presumably stands for the Turkish Playing Card Monopoly as printed on the box. The pack was purchased in Ankara in about 1992. 52 cards + 2 jokers + blank card in box with paper band around the box. Images courtesy Matt Probert.